Our wired and wireless networks connect people to the world. Anywhere. Anytime. Powerful, proprietary, industry leading: Our SNAP Centralized Management Portal optimizes performance for property owners and their guests. Only Technical Support Specialists with the very best knowledge and communication skills can ever answer a call from one of our customers. From simple to sophisticated, our custom portal options are the best in the industry. Many companies do what we do. But no one else does it like we do. Along the way, we have become certified, preferred and endorsed by today’s top hotel brands. Our Company motto is “Integrity First,” and our approach is simple: what would we do if we owned this property? 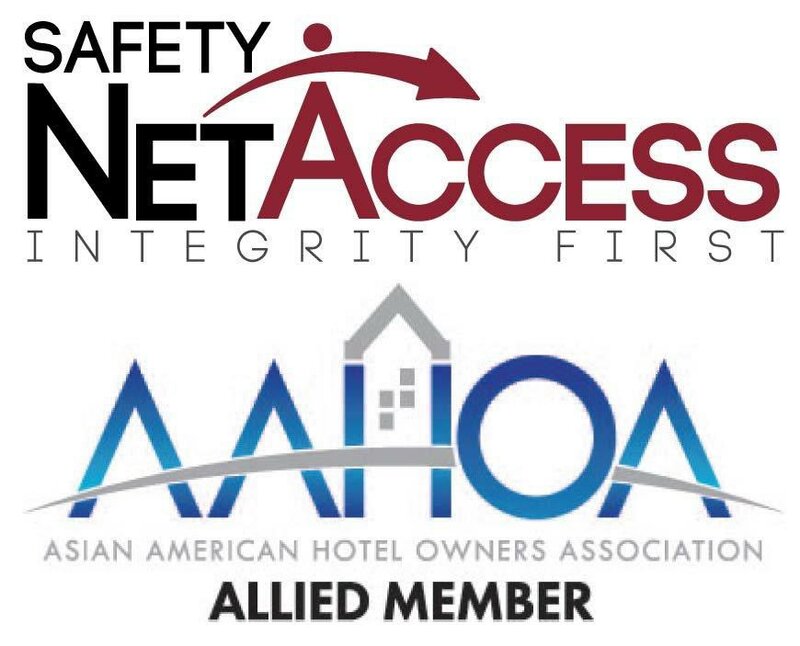 Since 2001, Safety Net Access has been designing, building and supporting wireless networks for hotels, resorts and other public properties. Wireless networks are in great demand today. People require a wireless connection everywhere they go. It’s all about immediate information – directions to a local restaurant, a Facebook update, loading the latest picture to our Twitter account. In order to keep up with this activity, it is important to find a wireless hotspot to handle our needs. Wherever you turn – a coffee shop, a restaurant, a campsite, a marina, an airport, or a hotel – having a wireless network is a must. A must for the guest as well for the business itself. Indeed, wireless networks are so important in hotels these days that they rank second only to hot water in most hotel surveys. People simply need to be connected. As a leading wireless Internet provider with an “integrity first” philosophy, we survey, design, build, and support wireless networks for the hospitality industry – all with our clients’ specific needs in mind. This industry includes hotels, resorts, assisted living centers, time-share properties, coffee shops, restaurants, schools, and retail environments. Our wireless networks assist by making available the “life-blood” of business and social interactions today – the Internet! Our wireless networks allow people to connect to the Internet via all types of devices including phones, laptops, tablets, iPods, and gaming consoles for guests. They also help with back-of-house applications for house keeping and engineering such as door locks and push-to-talk systems. The networks can be accessed using various types of onboarding processes. Guests can be connected via a connect page that utilizes identifiers such as passcodes, email addresses, or credit cards. This allows us to control who does and doesn’t access the network. Our networks are built to provide convenience, mobility, productivity, expandability, and security. As a leading Managed Service Provider (MSP), we build the best wireless networks available to meet your demands. At Safety Net Access we place special value on our role and our reputation as the industry leader in delivering wired networks with our “integrity first” philosophy. Much of the talk these days is about wireless networks. But, of course, the wired network plays a crucial role in all high-speed networks – even those that are wireless. Even wireless networks must still have a solid wired network at the foundation. So, we build a wired component into all of our wireless networks. Our wired networks provide the backbone to the wireless access points by running cables from the head end of the building to each access point. Often, these hard wired components act as the power source for the access points, thus ensuring your business avoids costly electrical outlets. With our unique approach and style we continue to design, build, and support the wired aspects of all of our wireless networks. The debate persists between the effectiveness of wired networks versus completely wireless networks. It simply comes down to the importance of knowing what does what. In wired networks, the connections are not as prone to signal interference, as they are in wireless networks. And the connections and data transfers are often faster. In addition, wired networks are less likely to go down as the result of a lost Wi-Fi signal. And security in a wired network is generally regarded as more solid. As with our wireless networks, our wired networks are managed and maintained 24 hours a day, 7 days a week. Our help desk experts are manned by our live Safety Net Access technicians, available to assist and answer your questions any and every time you have them. We find the best broadband options available, and optimize it just for you. We are proud to share our deep technology and industry knowledge with our valued clients. Through our consistent commitment to quality and service we deliver our properties broadband services from some of the top Internet Services Providers in the nation. Even before the Local Area Network (LAN) is built within the property, you must first bring the Internet into the building through some form of Internet pipe. So, as well as designing, building, and supporting wired and wireless networks of all shapes and sizes within properties, we also supply the connectivity (through an Internet Service Provider) necessary for the network, by providing various broadband solutions. We find the solution that is right for you! As a “vendor neutral” provider, we work with all the top communications partners to bring our clients the most cost-effective solution along with the best fit and functionality for them. Capping guests’ maximum bit rate at some fixed value (e.g. 1 or 2 Mbps), regardless of the number of guests using the services or the maximum bandwidth available. Internet Gateways cap bandwidth for the entire gateway. Safety Net Access can also cap bandwidth by individual users. Bandwidth can even be capped by group or passcode. Actively dividing the available bandwidth by the number of guests connected. Certain SNA gateways actively allocate bandwidth based on the number of active users on the network. Allocating bandwidth on the fly based upon the number of users, the type of application (email vs. video streaming. etc. ), real-time bandwidth desired, and potentially offering a higher grade of service (at an additional charge). Traffic shaping is a means to control the volume of traffic being sent into a network for a specified period (bandwidth throttling) or the maximum rate at which the traffic is sent (rate limiting). Our gateways can rate-limit inbound and outbound traffic. A load balancer can support quality of service traffic shaping based on traffic port and protocol. For example peer-to-peer traffic uses TCP ports above 1024; P2P traffic can be given a lower bandwidth priority than conventional web, VPN and streaming applications – these could be based upon corporate and individual property requirements. In the event the property has multiple sources of bandwidth, the HSIA supplier will be asked to provide solutions for the property to link or aggregate these sources. In addition, there should be an option for load balancing/ link balancing of the aggregated bandwidth. We are proud to have earned the reputation over the years as a trusted leader in the wired and wireless network arena, providing services for a variety of Wi-Fi-dependent industries, including hospitality, healthcare, quick serve restaurants, education, and more. We share with our clients our industry expertise and experience, and our deep technology strategy knowledge. Through extensive research, we are able to develop strategies for customers on how best to build reliable, cost effective networking solutions. Our customers include hotels, management companies, restaurants, coffee shops, assisted living centers, and schools. The solutions encompass everything from simple hotspots with a portal, to very complex, campus-wide wireless networks that incorporate many buildings and multiple ISP’s with more complex portals that include choices for payments, speeds, and pass codes. Safety NetAccess, coupled with a team of proven industry experts help our clients find the best possible solutions within their budget. Our Safety NetAccess 24 / 7 tech support is easily accessible via our toll-free number — 1-888-636-5212. Our call center consists of Tier 1 and Tier 2 level agents with expertise and access to all the necessary management tools for remote troubleshooting and monitoring. We recognize the importance of captive portal services for the simplification and identification of the login process, and we lead the industry with our customized process. Captive portal services and our custom captive portal webpage login process are uniquely designed for ease of use while securing your network. In addition – and from a liability standpoint – your captive portal is an important component to your network and can be critical in protecting your organization. Our standard portal page designs are free to existing clients. While most portals present an authentication screen before allowing Internet access for a guest, we offer several uniquely “customized” methods of authentication through our captive portal designs. Our designs give customers options. They can choose an easy one-click acceptance of terms & conditions; authenticate to a PMS; pay by credit card; provide a passcode or coupon; or any combination of the above. Whether you are operating a hotel, hospital, restaurant, coffee shop, retail store, or college campus, and you have access to the Internet, you will need to implement some form of portal page, or “welcome screen.” Portal services are a specifically customized means of authentication to the Internet for guests and clients. We maintain an impressive track record for the development of some of the most sophisticated client portals in the industry. We can even customize portal pages to align with your brand look and feel. Our Safety NetAccess Portal, (SNAP) is an advanced back-end software program that contains all the technical information required to troubleshoot or assist you with your needs. With one click of the mouse, our agents have direct access to any and all managed equipment at any location. Our on-point monitoring system detects equipment outages to notify our agents to begin troubleshooting even before the phone rings. Our advanced system delivers trending alerts to our Network Operations Center (NOC) from specific sites when they exceed certain thresholds. This allows us to identify any trends that may be causing problems for guests and fix them. Safety NetAccess’s technology partners share our vision for providing the utmost in customer service and security. Our Safety NetAccess technology partners represent world- leading organizations in the wired and wireless networking arenas. Having been in the wired and wireless networking business for more than 15 years, we have developed strong, lasting, and trusted relationships with our partners that extend far beyond just the purchasing of a piece of hardware. Our close relationships with our partners have allowed us to establish an edge in our business through product knowledge, the latest firmware releases, and pricing. Our partners provide the products. We make those products better through our service commitment to you. "The price is right but more importantly, the value is high"
"The SNA team becomes part of our team with serious personal intent and commitment." "They take ownership of their services, and they don't give excuses"
"They take issues seriously with quick resolution"
"The competition doesn't care the same way they do." "SNA is committed to 'doing the right thing' no matter what, even if it isn't their problem! They stick their neck on the line." "They deliver the right solutions...a quality product...at the right time"
Many companies do what we do. But no one else does it like we do. Because for us, it’s personal. Since 2001, Safety Net Access has been designing, building and supporting wireless networks for hotels, resorts and other public properties. We’ve grown from a two-man start-up to one of the country’s most trusted providers, and yet we still feel like we’re just getting started. Along the way, we have been certified by Marriott Hotels, are a preferred vendor for Wyndham Hotels, and an endorsed vendor for Best Western Hotels. While we are very proud of these designations, what truly excites us is thinking about the millions of guests who have had a flawless experience with our equipment. And the hard working staff who never had to worry about those guests. Our Company motto is “Integrity First.” Because for us, it’s personal. It’s so personal that when we design a solution for a property, we think about what we would want if we owned that property. It’s so personal that Company leaders interview every potential Technical Support Specialists to ensure that only those with the very best knowledge and communication skills can ever answer a call from one of our customers. It’s so personal that we ask prospective customers to give us their toughest property so that we can demonstrate what we can do. It’s so personal that after exploring the off-the-shelf options available, we decided to create our own operational support system to facilitate the management of the network and guest connectivity after installation. As you consider which provider to engage in your project, we hope you will take the time to find out what personal service means in this industry. We’re confident that once you get to know us, you’ll want to work with us. If not, we promise not to take it too personally!